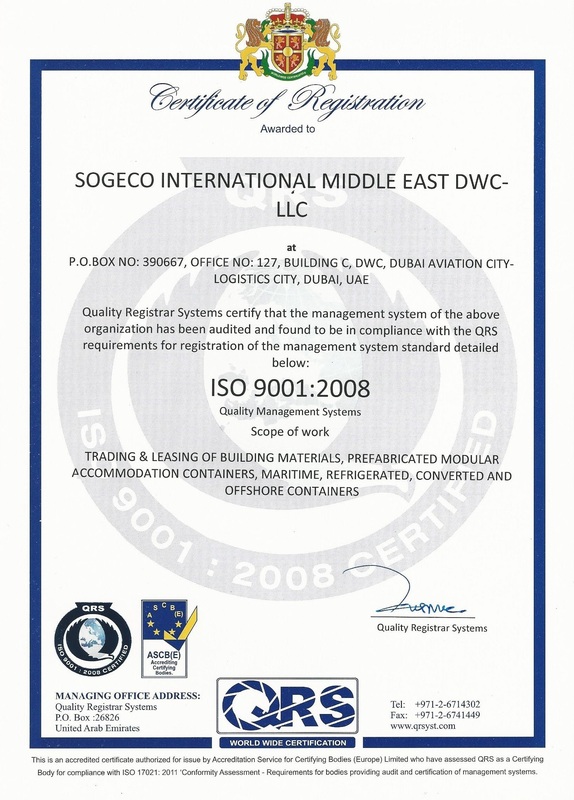 Sogeco Middle East is ISO 9001:2008 accredited technical consultant and supplier of accommodation containers & housing containers, office containers, shelters, porta cabin, converted ISO containers, flat packs as well as turnkey labor and workforce camps, schools, clinics, hospitals, dining halls for a variety of end users; from catering and general construction companies to the oil and gas and mining industry in U.A.E but also in Oman, Qatar, Iraq, Saudi Arabia and surrounding GCC and Middle East countries. The business activity also includes supply trading and leasing of new and used ISO maritime containers, refrigerated and offshore DNV containers. Sogeco Middle East is providing technical consulting services on modular design and 3D modeling. Our modular system can be applied to variety of architectural solutions such as offices, workers camps, apartments, hotels, etc. We are proud to announce that we have secured ISO 9001:2008 accreditation for supply of building materials, prefabricated accommodation modular units, maritime, refrigerated, offshore and other special containers. Sogeco International, a fast-growing independent container company, delivers new and used maritime storage containers not only to international shipping companies but also to a wide range of customers worldwide. Besides the traditional reefer containers Sogeco International can provide the new "Polar Box" containers, specially designed and manufactured to be used in the chemical, pharmaceutical, agricultural and food industries. Sogeco International can deliver to any destination a wide variety of ISO and non ISO special containers, ranging from customized units to open side, double door, low cubes, MAFI trailers and the well-known mini storage container sets available in various dimensions. Based on the experience gained through our container sales, servicing and repairs, in the early 2000s Sogeco embarked on a new venture: trading accommodation units. We have developed a wide range of products includ ing flat-packed and lighter structure containers. These units have been engineered by professionals in their field from Italy and Switzerland and are now supplied throughout Europe, Africa, the Middle East and many other demanding markets worldwide. Quantities are increasing year on year.